On Sunday Eisley was baptized at Epiphany Lutheran. 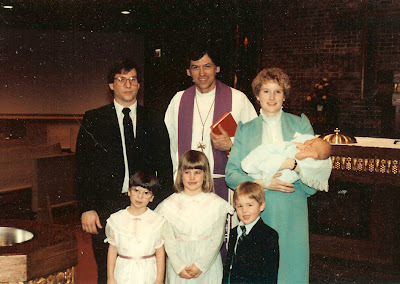 I thought it would be fun to show pictures of Justin and I on our baptism days - 24 years ago. 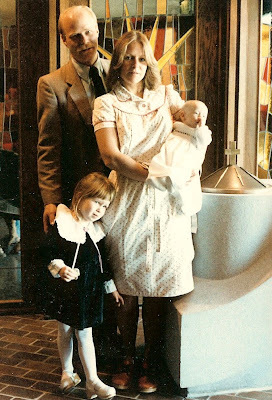 So here is the Sander family, dressed to the nines for 1984. Justin was baptized on April 1st. In the front are Justin's siblings, Adrienne, Katie, & Todd. 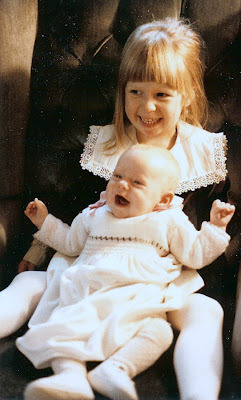 Here's me on my sister's lap in the dress that Eisley wore for her baptism, almost exactly 24 years later. It was Reformation Sunday, so the church was decked out in red and black. Here we are with Peter and Angela up at the front of the church. Eisley started fussing about this time (hungry). Any family out there who have anymore great photos to send, please do! I love the baptisim dress, sentimental. I love your Mom's Ferrah duo, great hair.